Quinn Dolan, right, poses with former NFL coach and Pennsylvania Sports Hall of Fame guest speaker, Earle Mosley III. 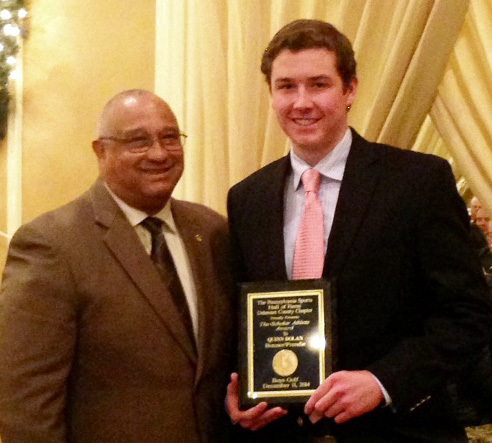 Quinn Dolan, a senior at Monsignor Bonner and Archbishop Prendergast High School in Drexel Hill, was inducted recently into the Pennsylvania Sports Hall of Fame, Delaware County Chapter. The evaluation committee selects from an elite group of athletes based on scholarship, athletics and service. Dolan’s character embodies all three of these qualities. As a scholar, he ranks at the top of his class and is a member of HI-Q, Mathletes and the National Honor Society. As an athlete, he served as golf team captain for his sophomore, junior and senior years and earned team MVP and All-Catholic honors. He also competed on the baseball and lacrosse teams. In the area of service, Dolan is the president of the Community Service Corps, vice president of Student Council and a Student Ambassador leader. He designed a series of month-long projects designed to help those less fortunate in the community and volunteers with the Mid-Atlantic Blind Golfers Association.